These motherboards were pulled from lightly used, tested systems, and they are in 100% working condition. Includes Hinges, Wifi antennas and LCD cable. ▷ Compatible Models: ASUS ASUS Q504UA Q504U Q504 Q534U UX560U UX560UX. ▷ Part Number: 13NB0BZ2AM0111 13NB0BZ2AM0141. ADD TO FAVS. ASUS 15.6" X551M X551MA Palmrest 13NB0481AP0321 with Touchpad Keyboard "NICE"
Item is inGOOD condition. Fully functional unit with scratches. 5 out of 5 stars - ASUS 15.6" X551M X551MA Palmrest 13NB0481AP0321 with Touchpad Keyboard "NICE"
7 product ratings7 product ratings - ASUS 15.6" X551M X551MA Palmrest 13NB0481AP0321 with Touchpad Keyboard "NICE"
There is a scratch on the back in the upper right. 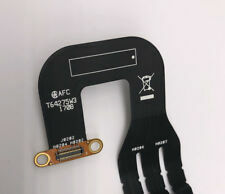 (see pict) The hinge cover is a little loose and needs to be pushed back into place once in a while. The battery works for 3/4 hours. Maybe longer. Asus K55-A, U57A. This may be the part you need to replace your broken keyboard. Laptop Keyboard Skins. Printer Parts & Supplies. The guidelines are below. Compatible Models. Asus TP500L TP500LA Laptop 15.6" HD LCD Touch Screen. Condition is Used. Shipped with USPS Priority Mail. ASUS G73jh SATA Connector. If there are any flaws or issues with the item, I will show. system with any issues. them the best I can in the detailed pictures. 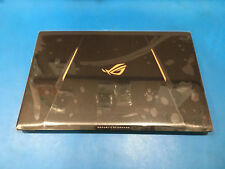 New Asus ROG G46 G46V G46VW Series 14" Palmrest Case With Backlit Keyboard With Touchpad 13GNMM10P050-1. ROG G46V Series. ROG G46VW Series. ROG G46 Series. Type: Laptop Upper Palmrest Case. Just give us the opportunity to resolve a problem. Found better price?. (USA only) - write to us to negotiate a better deal! Wewill be happy to help you with a service advice. IMPORTANT INFORMATION. Trending at $17.64eBay determines this price through a machine learned model of the product's sale prices within the last 90 days. Asus U56, U56E. This may be the part you need if your laptop is overheating or if your current fan has stopped working. Laptop Cpu Fans. 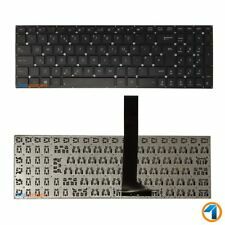 Laptop Keyboard Skins. Laptop Keyboards. Laptop Batteries. Laptop DC Power Jacks. This part is tested and is in 100% working condition. ALL PRODUCTS ARE MARKED WITH SERIAL NUMBER AND QC BADGE. No one is EVER ignored! Upgraded 120 GB Solid State Drive – much faster than original slow spinning hard drive. Windows 10 Professional 64-bit. Clean install Windows 10 Professional and up-to-date security patches. Includes original power adapter. Keyboard Base Dock USB for Asus T100THA. ASUS K53E-BBR5 Replacement Laptop 15.6" LCD LED Display Screen. Condition is Used. Shipped with USPS Priority Mail. Power Switch Button for Asus IO Board Q302LA TP300LA Q302L TP300LD. Genuine New black US keyboard for ASUS ROG G701VI Series, with backlit. Compatible Model:for ASUS ROG G701VI Series. with backlit ribbon. Color: Black. Original photos. Wewill be happy to help you with a service advice. IMPORTANT INFORMATION. Accepted for "I have chosen the wrong keyboard key & hinge for my keyboard" "i thought this was the right fit for my keyboard". MOREOVER, if you want the ALT, CTRL, SHIFT key, let us know on which side of the keyboard so we can provide you with the correct one. Asus X501, X501A, X501U, X501EI, X501XE, X501XI. Laptop Keyboard Skins. Laptop Keyboards. Laptop Batteries. Laptop DC Power Jacks. Laptop Cover Parts. Laptop Cpu Fans. Laptop Hinges & Brackets. 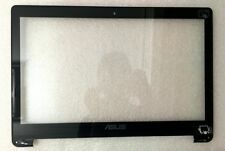 Asus Q502L 15.6" LCD Back Cover p/n 13NB0581AM0231. Includes the the back lid only. Does NOT include the lcd panel, front cover, hinges, webcam, front bezel or the glass that goes over the screen. This is for models with a 15.6" LED LCD, will not work with models with other types of screens. This list is for: New US Keyboard for ASUS X540 X540L X540LA X540LJ X540S X540SA X540SC. Compatible with: ASUS X540 X540L X540LA X540LJ X540S X540SA X540SC. This item has been carefully removed from a pre-owned laptop and has gone through rigorous testing to ensure it is fully functional. 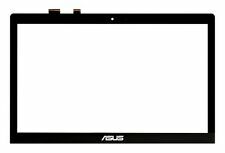 15.6" Touchscreen For a Asus Q502L models Pulled from a Asus Q502L, may work in other models. This is for a touch model. WXGA Model LP156WF6(SP)(B1). Includes the LCD screen, the digitizer, the front bezel and the touch glass. Trending at $7.49eBay determines this price through a machine learned model of the product's sale prices within the last 90 days. Excellent working condition, and very good physical condition. May show very light signs of usage, without any noticeable imperfections. May show a few very light insignificant scratches. Wewill be happy to help you with a service advice. Asus Transformer Book T300 Chi Lcd Touch Screen & Digitizer FHD 1920x1080 12.5"
Laptop Lcd Cables. Laptop Lcd Screens. Laptop Cover Parts. The guidelines are below. Laptop DC Power Jacks. Laptop Batteries. Compatible Models. ASUS Google Hangouts Meet Speakermic - Black. Condition is New. Shipped with USPS Priority Mail. ASUS A8N-SLI Deluxe Motherboard W/ AMD CPU NOT INCLUDED.